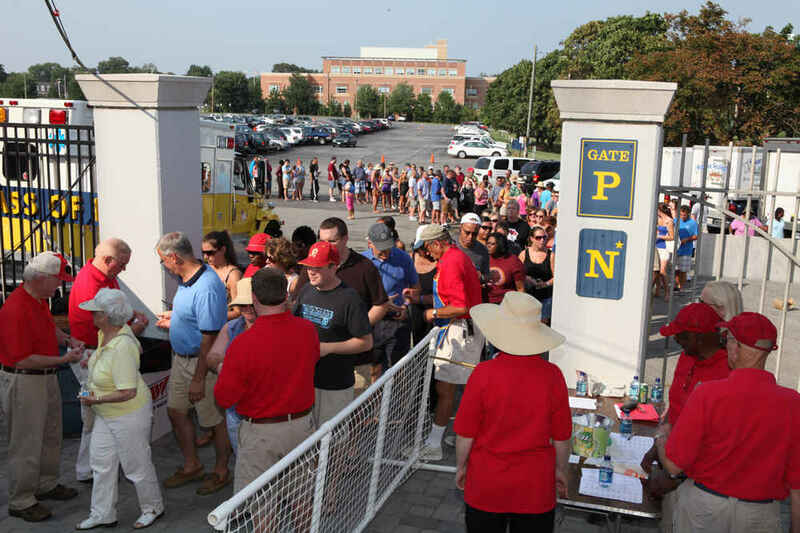 Annapolis, MD (March 20, 2015) – The Rotary Club of Annapolis is gearing up for its 70th annual Crab Feast scheduled for Friday, Aug. 7, 2015, from 5 to 8 p.m. at the Navy-Marine Corps Memorial Stadium in Annapolis. This special event is not only the world’s largest crab feast but also a major fund-raiser which benefits local community and cultural organizations. The feast is all-you-can-eat and drink, including large and #1 male crabs (the big ones) plus Maryland vegetable crab soup, sweet Maryland corn on the cob, beef barbeque sandwiches, all-American hot dogs, watermelon, draft beer, and assorted sodas and water. A bake sale and cake raffle can finish your feast with sweetness. Regional Watermelon Queens will slice and serve fresh watermelon. Also for sale will be Crab Feast T-shirts and other memorabilia. Annapolis Green, a local environmental group, is working with the Rotary Club of Annapolis to compost all the crabs and other food, utensils, and beverages at crab feast as was done in 2014. The two groups want to make this charitable fund raiser a zero waste event. Last year the two groups held one of the largest recycling and composting events they have conducted. One of the largest challenges is completing the job so the stadium is clean and ready for the next day’s activities. About 20,000 pounds of food waste will be collected. In just about two months after the crab feast, the watermelon rinds, corn cobs, brown paper, and even the crab shell bits will turn into compost that will benefit gardens all over the area. Plastic will be collected, too, to reach the event goal of sending nothing to a landfill.